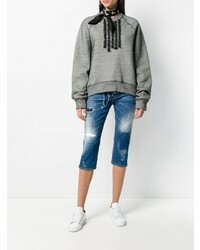 Dress in a white v-neck t-shirt and Dsquared2 Slouch Pedal Pusher Jeans from farfetch.com to be both killer and relaxed. Round off this outfit with red slip-on sneakers. If you're all about relaxed dressing when it comes to your personal style, you'll love this seriously chic pairing of a navy puffer jacket and Dsquared2 Slouch Pedal Pusher Jeans from farfetch.com. And if you want to instantly amp up the style of your look with one piece, enter beige suede ankle boots into the equation. If you're after a casual yet absolutely chic look, choose a camel coat and blue ripped skinny jeans. As well as totally comfortable, these two items look great when worn together. Sporting a pair of brown leather pumps is an easy way to add extra flair to your getup. If you're obsessed with relaxed dressing when it comes to your personal style, you'll love this totaly stylish pairing of a pink print bomber jacket and Dsquared2 Slouch Pedal Pusher Jeans. Bring instant glamour to your ensemble with black leather heeled sandals. If you're in search of a casual yet seriously chic look, try pairing a blue double breasted blazer with Dsquared2 blue ripped skinny jeans. These pieces are super comfortable and look great when worn together. 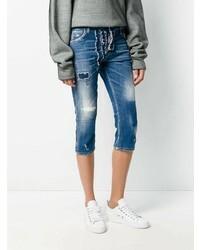 Rock a beige oversized sweater with Dsquared2 Slouch Pedal Pusher Jeans for a casual coffee run. Dark brown leather loafers will instantly smarten up even the laziest of looks. If you're a fan of relaxed dressing when it comes to your personal style, you'll love this extra cute pairing of a grey plaid blazer and blue ripped skinny jeans. Take a classic approach with the footwear and rock a pair of black leather loafers. 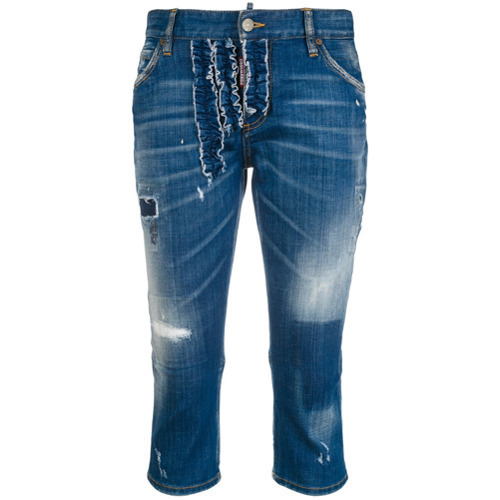 If you're looking for a casual yet stylish outfit, wear a white dress shirt and Dsquared2 blue ripped skinny jeans. Both items are totally comfy and look fabulous together. Add a glam twist to your getup with silver leather pumps. Rock a tan sleeveless top with Dsquared2 Slouch Pedal Pusher Jeans if you're on a mission for an outfit idea for when you want to look casually cool. Up the ante of your outfit with tan leather pumps.